Its the start of Volunteers’ Week today and we would like to say an emphatic THANK YOU to every single person who has offered their time and expertise over the past year to UCL’s SCAR department, without whom many a project would have been difficult or even impossible to complete. There is a wide range of roles that volunteers can take up within SCAR: helping with events, sorting through new collections, enhancing cataloguing, assisting in exhibition preparation, helping with our media and online communications (the list goes on!). Throughout Volunteers’ Week we intend to share a snapshot of some of these roles with you. Each week day from today to the 7th June, a guest volunteer writer will bring you a ‘day in their life’. Our first blog is from Calum Cockburn, who recently started to help us improve our understanding (and therefore cataloguing) of some of our manuscript fragments. My work as a volunteer involves studying and transcribing Special Collections’ manuscript fragments, checking their catalogue references, and identifying the texts they might contain. My current project is MS Frag / Lat / 7, a twelfth-century Latin manuscript, composed of six loose folios, apparently taken from different parts of the book. The manuscript is full of wonderful details: two columns of Latin text, with many unusual scribal abbreviations; long-fingered manicules pointing to specific lines; large decorated initials; blue and red paraph marks and rubrication; many examples of later fourteenth- and fifteenth-century annotations and stains on both flesh and hair sides, suggesting that at one time it was well-used. The texts the manuscript contains have proven difficult to identify – not least because the surviving pages are not always consecutive – though at least one appears to be a copy of a treatise on vomiting and stomach purgations by Pietro d’Abano, an early medieval Italian astrologer, professor of medicine and infamous compiler of magic texts. 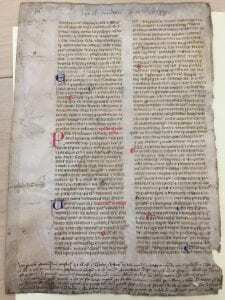 Excitingly, the manuscript is also the subject of the latest in a series of workshops jointly run by Yale and UCL: ‘Digital Editing and the Medieval Manuscript Roll / Fragment’ (DEMMR/F). This two-day event happening in the first week of June will use the manuscript fragments housed in Special Collections as a means of training attendants in palaeography and manuscript studies (their original purpose when they were first bought by UCL almost a hundred years ago), and at the same time consider the issues around creating digital editions of such texts.